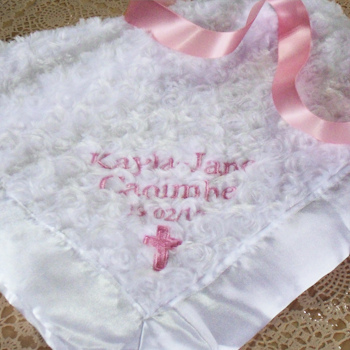 This white rosebud fleece baby wrap is the ideal gift for a new baby and when personalised makes a wonderful Christening blanket! Swaddle baby in this ultra soft and snuggly rosebud shaped textured baby shawl made of easycare polyester that is very gentle to babies skin. Machine washable up to 40 degrees with light colours, air dry. Delicate rosebud style weave design plush fabric to make the feel extra soft touch. Personalised with an embroidered name or initials and a short DOB (number format - 17.04.13) Choose your thread colour and letter style, we will sew this towards one corner of the baby blanket.